Congrats Joe & Rich on 30 years of service! Home / Blog / Congratulations On 30 Years Of Aircraft And Jet Maintenance Service! 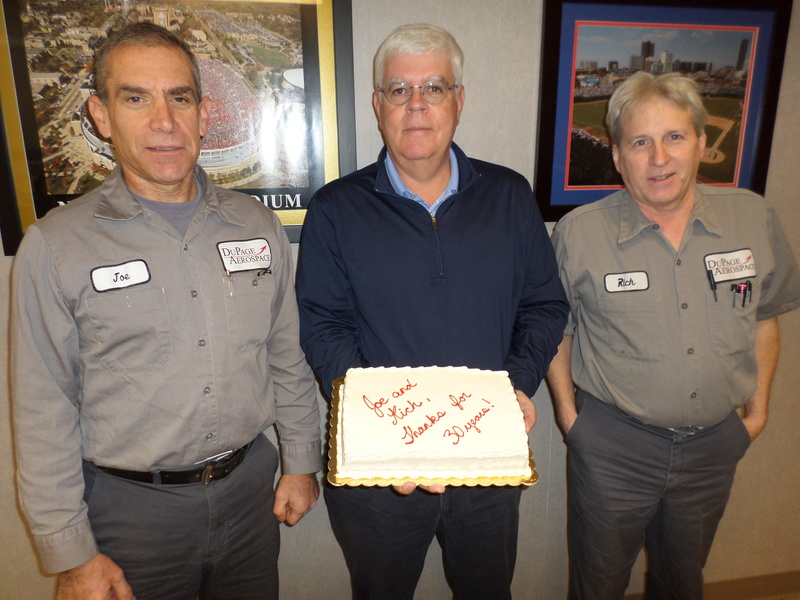 DPA would like to congratulate Rich Stark and Joe Tennant for their 30 years of service! Rich Stark started working for Tony Aiello’s FBO in October of 1983 and Joe Tennant joined shortly thereafter. It is uncommon in today’s business environment to see key people stay for this period of time. In recognition of their years of hard work and dedication, DuPage Aerospace recently hosted a luncheon in their honor. When Rich and Tony started with the organization, they worked primarily on single engine piston powered airplanes. Their knowlege and ability certainly has grown over the years and now they primarily work on jets and turbine powered aircraft. Thank you Joe and Rich! Congrats on 30 years Joe & Rich!